File photo of Housing Minister Eoghan Murphy. THE HOUSING MINISTER has been called on to make a statement on whether he instructed local authority chiefs to not include over 100 households in the latest homeless figures, despite the fact that they were actually homeless. The call comes after Louth County Council said that it was told by the Housing Department not to include people the council considers homeless in the monthly homelessness figures. In a memo sent out to local councillors – and seen by TheJournal.ie - the Housing Services division of Louth County Council states that a reduction in the number of homeless people in the county in March was due to a request from the Housing Department to leave out certain households from the monthly figures. The memo was sent after Housing Minister Eoghan Murphy announced earlier this week that the number of homeless people in the country was actually lower than previously reported. He said that this was because a number of local authorities had been “erroneously” miscategorising people who were living in secure accommodation as homeless. This resulted in an additional 600 people wrongly being counted as homeless in monthly figures released by the Housing Department, Murphy said. In the Louth County Council memo, the Director of Housing Services referenced recent media reports into the homeless numbers and said that the council commits “significant resources to providing solutions to persons who present as homeless”. The director said that emergency accommodation for these families had usually taken the form of hostels, but that in recent years the council had also paid for hotels and B&Bs to be used to house homeless families. “When pressures were at their highest, Louth County Council had 155 number of clients – 45 in hostel accommodation and 110 in hotels and B&Bs, of which 37 were children,” he said. You will have noted these figures in our monthly reports to Council. However, he said that recently the council had been leasing private houses from landlords to provide an alternative to B&B or hotel accommodation for homeless people. At the end of March, 100 households including 32 children were accommodated in this type of accommodation in Louth, the director said. He made it clear in the memo that this type of accommodation is a temporary solution, and that people staying in the houses are not deemed to have their housing needs met, and therefore are still considered homeless. “It is important to note that the Council still consider these individuals as homeless and in all cases are planning their ultimate accommodation to be delivered through HAP (Housing Assistance Payment),” he said. He said that the Housing Department had requested that this group of people be excluded from the March homeless figures. “For the March national figures the Department requested all Local Authorities not to include these households in the figures reported,” the director said. This reduction is now the matter reported in the media. Following on from the minister’s statements on the homeless figures, Sinn Féin housing spokesperson Eoin Ó Broin said that he had spoken to a number of local authority heads and that it was his view that all of the 600 people in question were in fact homeless. “This is an absolutely deliberate attempt to reduce the figures by the department by misrepresenting these people’s situations,” Ó Broin told TheJournal.ie. 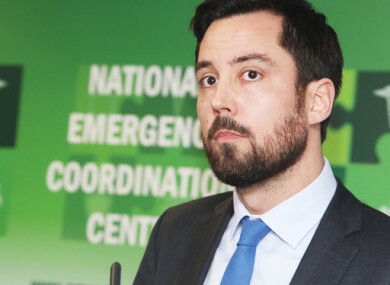 Ó Broin questioned whether Eoghan Murphy was instructing local authorities to take homeless families off the March figures. “What [the minister] needs to do is he needs to come out as a matter of urgency and to justify his decision,” Ó Broin said. And if I’m right… he needs to republish March’s figures with all those individuals who are in emergency accommodation type arrangement and he needs to apologise to the local authorities but more importantly to the homeless families who he’s claiming today aren’t homeless. Minister Murphy said this week that a number of local authorities had “erroneously categorised” people who may have been living in local authority-owned or leased housing, or who were living in private rental housing but receiving social housing supports, as being homeless. Murphy made this announcement as he released the March figures for homeless people living in state-funded emergency accommodation across Ireland (these numbers are usually used as a shorthand for the number of homeless people in Ireland). The figures showed that there were 126 fewer people accessing emergency accommodation across the country in March than in February. This came after record rises in the number of homeless people in January and February of this year. However, the minister said that “some, but not all” of the 600 estimated people who shouldn’t have been included in the figures had been removed – meaning that the figures are not fully accurate. Speaking on RTÉ’s Morning Ireland on Tuesday morning, Minister Murphy said that “at least five” local authorities had provided inaccurate figures on homeless numbers due to miscategorisation. The Minister said that work was still ongoing to figure out the extent of the issue, but he named Meath and Louth County Councils specifically as councils that had miscategorised people as homeless. The Louth County Council memo makes it clear that officials in Housing Services there disagree with Minister Murphy and the Housing Department over who should be categorised as homeless. It would appear that the council is using privately-owned homes as a form of emergency accommodation, until homeless people living there find a permanent arrangement (most likely through HAP). Sources have told TheJournal.ie that there seems to be no reason these people should be excluded from the national figures, as they are technically homeless. A spokesperson from the Housing Department stated that it was still working with all local authorities to determine which groups were being counted as homeless and that the work “will be completed as soon as possible”. The spokesperson said that Louth County Council and the department had agreed that people living in private houses or leased houses should “not be classified as being resident in emergency accommodation”. The spokesperson also said that this agreed position was “reconfirmed by Louth County Council [yesterday]“. TheJournal.ie sent a detailed set of question to Louth County Council in relation to its homeless figures. A spokesperson said that it would not be making any further comment on the issue. No further memos have been sent by the council to local councillors signalling a change in the council’s position. Homeless accommodation is paid for through a form of funding called Section 10 funding (meaning Section 10 of the Housing Act). This is funding paid by the Housing Department to local councils or charities for the care of homeless people. In the case of Meath County Council – which the minister said had miscategorised people as homeless – a spokesperson told TheJournal.ie that the council had been intervening with landlords who were moving to evict tenants from their property. “The Council then engages with the landlords concerned to retain families in their existing accommodation until alternative accommodation can be found,” the spokesperson said. This policy has been followed in order to avoid these families becoming homeless and having to place them in emergency accommodation. The spokesperson said that it had been including this group of people in its monthly homeless figures, but that it was now “reviewing this method of recording and presenting the emergency accommodation figures”. It is believed that Meath Council paid for the families to be kept in accommodation using Section 10 funding. In the case of Louth, Section 10 funding was also used for housing the families not counted in March’s homeless figures. “The Department understands that Louth County Council may have been funding some of the leased private dwellings involved from Section 10 funding. However, given the classification issue that has arisen, the Department will be working with the Council to establish whether section 10 or one of the range of other funding programmes, such as the leasing programme may be more appropriate. A spokesperson for the Dublin Regional Homeless Executive said that it was currently working on a report on the number of people who presented as homeless in January and February of this year and that it hoped to publish this report “shortly”. The DRHE spokesperson said that a number of families who were residing “in social housing units or in properties with leasing arrangements” in Dublin had been miscategorised as homeless. In Dublin there are 26 families that fall into this category – 39 adults and 85 children – the spokesperson said. Email “Council told by Housing Department not to include people it says are homeless in monthly figures”. Feedback on “Council told by Housing Department not to include people it says are homeless in monthly figures”.